Global ENT & bronchoscopy devices market was valued at $14,476 million in 2015, and is expected to reach $24,999 million by 2022, growing at a CAGR of 8.1% during the forecast period. ENT devices are used to rectify smelling disorders, hearing disorders as well as problems associated with speaking or snoring. Bronchoscopy involves examination of the complete airway of a patient including lungs and alveoli. Both ENT & bronchoscopy devices assist otolaryngologists to treat patients suffering from disorders of ear, nose, throat and related structures of the head and neck. 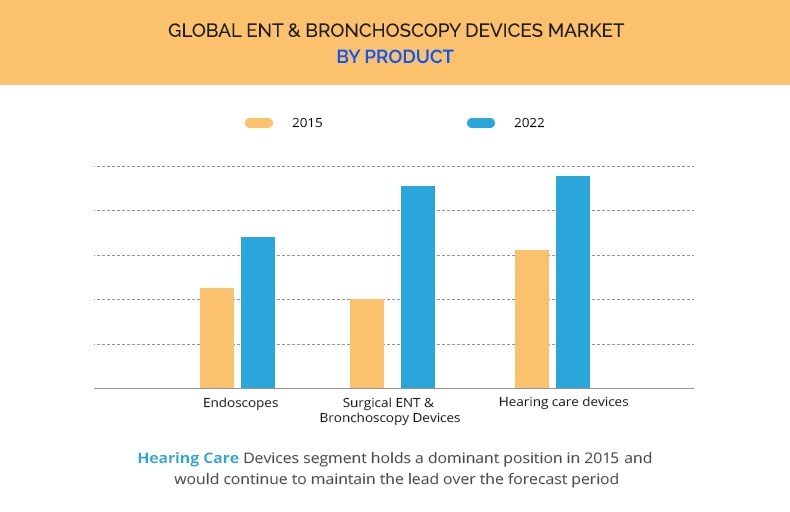 The market is driven by factors such as rise in incidence of hearing and nasal disorders, new technological advancements in ENT & bronchoscopy devices, growth in geriatric population, and increase in patient preference for minimally invasive procedures. However, the market growth is limited by high cost of these devices (especially in developing nations) and dearth of skilled professionals. Conversely, the demand for cosmetic ENT procedures and the emerging markets of the Asia-Pacific and LAMEA regions are expected to provide several opportunities for market growth during the forecast period. The hearing care devices segment accounted for the largest market share in 2015, due to increase in incidence of hearing disorders globally. According to the National Institute on Deafness and Other Communication Disorders (NIDCD), about 2 to 3 out of every 1,000 children in the U.S. are born with a detectable level of hearing loss in one or both ears. In addition, nearly 15% of adults (aged 18 years and above) in America have trouble in hearing. In addition, technological innovations in hearing devices have led to the development of miniature hearing aids that are not easily visible from outside, thus increasing the adoption of hearing aids. The development of anti-inflammatory drug-releasing cochlear implants is also expected to accelerate the market growth as the drug stops the immune reaction and inflammation in ear after surgery. Moreover, development of auditory brainstem implants is a major breakthrough for people with distorted auditory nerve. Hence, the hearing care market is expected to show considerable growth during the forecast period. Rise in focus of market vendors on emerging markets, namely, Asia-Pacific and LAMEA regions, is expected to boost the market growth. According to the estimates of World Health Organization (WHO), nearly 14% (about 28 million people) of the Brazilian population suffers from some kind of hearing problem. In addition, estimates of The Brazilian Institute of Geography and Statistics (IBGE) also reported that approximately 5.2% (9.8 million people) of the Brazilian population suffers from hearing loss directly. Among these individuals, nearly 2.6 million are deaf and 7.2 million have difficulty in hearing. Furthermore, around 20% of Brazilian pre-school children are estimated to suffer from hearing loss. Approximately 15&dash;20% of the Brazilian population (nearly one-fifth) suffers from tinnitus (perception of noise or ringing in the ears). Thus, Brazil offers a huge customer base to the ENT & bronchoscopy device manufacturers. ENT & bronchoscopy devices market has witnessed several clinical trials in the recent years. The hearing aids segment accounted for the maximum number of trials (247) in the market, owing to their increased demand due to increasing incidence of hearing disorders, affordability (low price as compared to hearing implants), and easy handling and usage. In addition, hearing aid manufacturers have adopted advanced technologies to improve the device efficiency and decrease its size. Therefore, new hearing aids are manufactured and hence need a successful clinical trial for marketing approval. The list of key players profiled in this report include Karl Storz Gmbh & Co. Kg, Medtronic PLC, Smith & Nephew PLC, Olympus Corporation, Johnson & Johnson (Acclarent, Inc.), Cochlear Limited, Hoya Corporation (Pentax medical), Sonova Holding AG, William Demant Holding A/S, Entellus Medical, Inc., MED-EL, Sivantos Pte. Ltd. and GN Store Nord A/S. Key players in the value chain include IntriCon Corporation, Starkey Hearing Technologies, Oticon Medical, HayMed Instruments, and OPTOMIC ESPANA S.A.
Extensive analysis by product helps in understanding the various types of devices used for treatment and monitoring of patients suffering from ENT disorders. The adoption of ENT & bronchoscopy devices, such as hearing aids and hearing implants, is expected to increase in the near future, owing to high prevalence of ENT disorders coupled with rise in geriatric population. The ENT & bronchoscopy devices market has gained the interest of healthcare providers due to the benefits offered by these devices for diagnosis and treatment of ENT disorders. There have been significant technological advancements in ENT & bronchoscopy devices to provide advanced treatment options for disease management. Asia-Pacific and LAMEA regions are expected to offer lucrative opportunities to market players, as the markets in the developed nations are saturated with large number of ENT & bronchoscopy devices providers. The global market is driven by growth in incidence of hearing and nasal disorders, new technological advancements in these devices, rise in geriatric population, and increase in patient preference for minimally invasive procedures. However, this growth is restricted by high cost of these devices (especially in developing nations) and dearth of skilled professionals. Conversely, demand for cosmetic ENT procedures and emerging markets of the Asia-Pacific and LAMEA regions are expected to provide several growth opportunities during the forecast period. Currently, the hearing care devices segment dominated the global ENT & bronchoscopy devices market, followed by the endoscope segment. The emerging nations witnessed rapid increase in the shipments of these devices to improve their healthcare infrastructure. This is expected to offset challenging conditions in the mature markets such as North America and Europe as these markets are near maturity phase. North America is expected to dominate the global market during the forecast period, followed by Europe. "ENT and Bronchoscopy Devices Market"